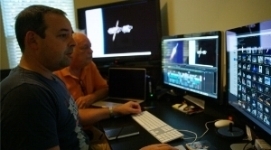 Writer-director Al Reinert was nominated for an Academy Award for his documentary For All Mankind, the definitive film about the Apollo lunar missions. To make it, he set the record for research in the NASA film archive and interviewed 22 of the 24 men who flew to the moon. He was nominated again for co-writing the screenplay for Apollo 13 and shared an Emmy Award for the HBO miniseries From the Earth to the Moon. He is no stranger to the subject and appreciates the challenges involved. John Aldrich is an accomplished producer, editor and cameraman, roles that will complement each other over the long course of producing this film. His work has aired on CNN, Discovery, National Geographic, and PBS well as for many major websites. More of his work can be found at jaldrich.net.